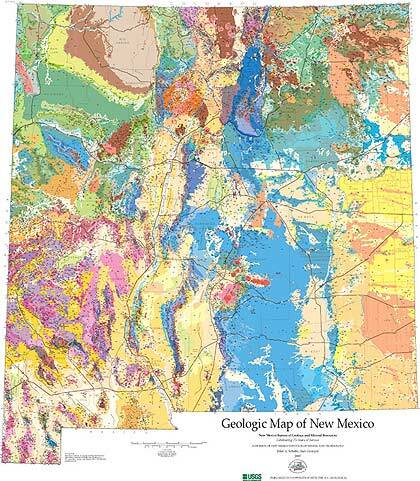 54" x 47" and 50" x 42"
This color state geologic map, published in July 2003, is the first geologic map of New Mexico to be published at this scale since 1965. Close to 20 years in the making, this map reflects the collective efforts of geologists from throughout the state. Over 100 geologic units are represented. Two sheets, including a detailed key and extensive references. Geologic Map of New Mexico, New Mexico Bureau of Geology and Mineral Resources, 2003, Scale 1:500,000. Note: This large rolled map requires an additional charge of $5.00 for cardboard tube and shipping. GIS data (an ArcGIS v.10 geodatabase and MXD map document) is available as a zipped 27MB file. 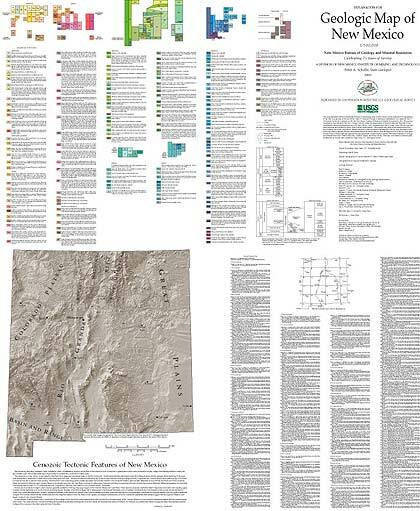 An older ARC/INFO version of the Geologic Map of New Mexico OFR-97-0052 is available from the US Geological Survey. Note that this GIS data does not include more recent revisions to this map done in 2003. Our Satellite Image of New Mexico (Resource Map-23) makes a fine companion to this geologic map since it is at the same scale (1:500,000) and also has the same Lambert Conformal Conic projection. Significant geologic features and landmarks are annotated on the map. You may also be interested in the smaller (1:1,000.000) Geologic Highway Map of New Mexico produced in cooperation with the New Mexico Geological Society. It is printed on both sides of a single sheet of durable waterproof material and includes cross sections and stratigraphic columns.